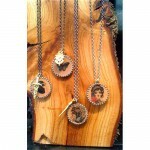 Check out our new Spitfire Girl Jewelry! new website and blog inner workings. 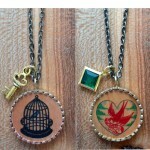 We are excited to introduce our latest addition the the Spitfire Girl, our wood jewelry line! Miniature versions of our most popular postcard designs. They measure 7/8″ in diameter. Set in silver with an 18″ silver chain, or brass with an 18″ gunmetal chain. wearing them home, or wrapping them up in our spitfire gift wrap as presents. We’d love to hear your thoughts, send ‘em our way.